Franck Lloyd Wright was for me – before this very day – the american architect of the falling water house, a few other rich wood-furnished houses around Chicago and a geometric decorated hotel in Tokyo ; the architect of cantilevered roofs, of plains-inspired flat buildings, of horizontal thin lines suspended over large welcoming shades. 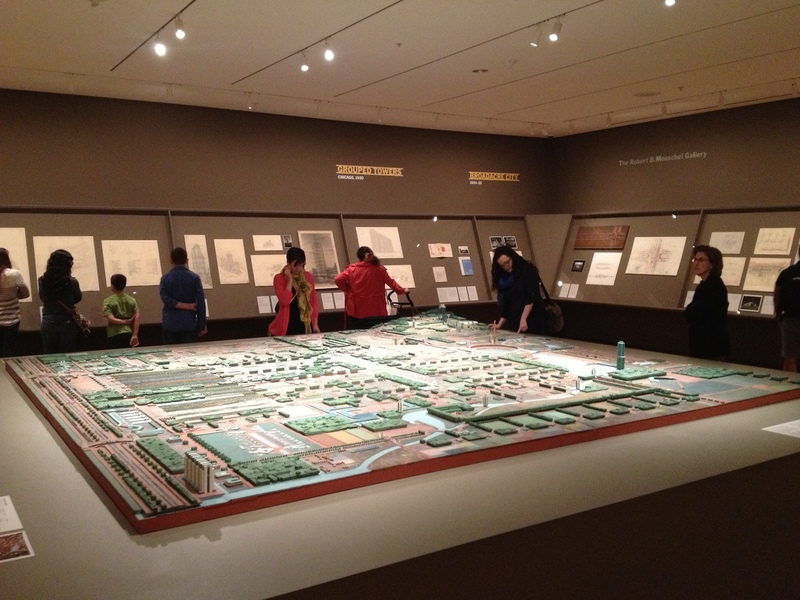 But the MoMA of NYC made me discover today the vertical side of the innovative architect. 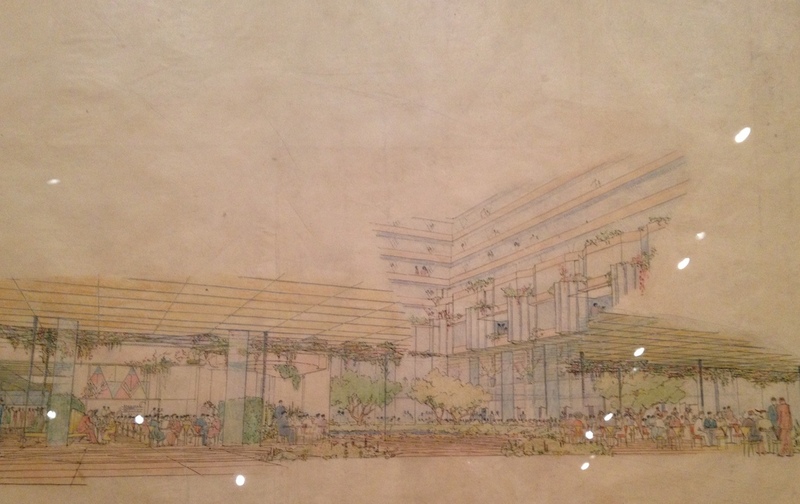 The exhibition, going on through june 1st, is called Franck Lloyd Wright and the city: Density vs. Dispersal and explore the ambiguity of FLW’s standing about the future of the city. In the 1930’s, the development of individual transportation and telecommunications would allow a spread city, where everyone owns a house. The dense and busy city developed through the industrial area had “nothing left to offer”. 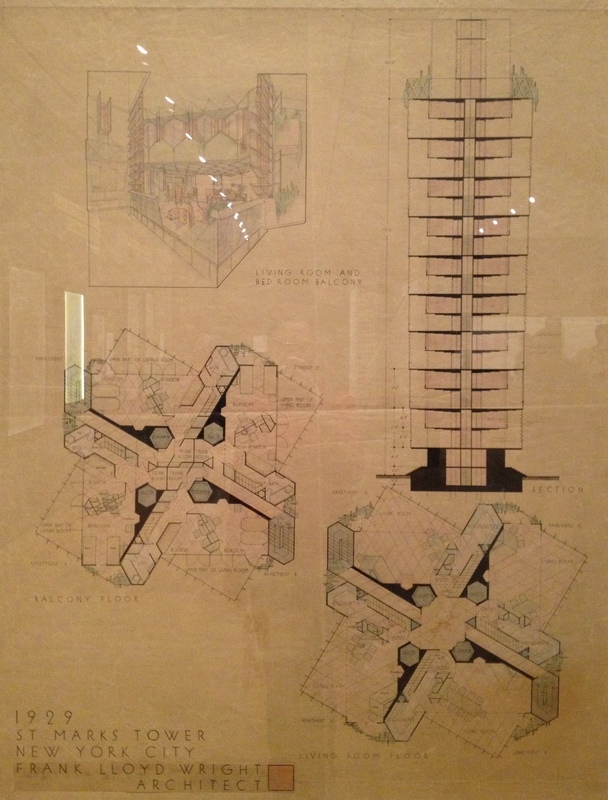 However, the exhibition, except from two houses, is mostly about Wright’s tower design. The one room exhibition consists in plans, models and details of about a dozen of towers designed between the 30’s and the 50’s. Each project is introduced with a few lines to understand its context, features and evolution, its story. I really appreciates this way of presenting architecture, as a multi-actors adventure, as a urban and political influenced standing, as a history-linked building. Some are very innovative, like the St Mark’s-in-the-Bouwerie tower, New York, 1927-31, where each squared shape level, cluster of four apartments, rotate from one floor to the other to create qualitative lighted duplex and an animated façade. Also, the crazy project of the Rogers Lacy hotel, Dallas, 1946-47, is quite surprising from the architect of landscape Wright was for me. The project takes an entire block to create this huge complex, like a little city within, organised around an open and refreshing central atrium. The only tower to got finally built is the H.C. Price company tower, Bartlesville, Oklahoma, 1952-56. See how precisely described the technical details are! I bet a very few architects nowadays would be able to dimension the steel reinforcements of a concrete slab! In fine, Wright’s compact and innovative towers were to be sprawled in a larger scaled city than the real one they were first designed for. As the Broadacre city project shows, the idea is to have a few high buildings scattered around in a green and sprawled houses context. The model of this utopia is quite impressive, even more after you’ve seen the short movie showing a whole bunch of students working on its building.